The characters in Bad Things Happen—professors, janitors, webcam models, small-time criminals—are between things. Between jobs and marriages, states of sobriety, joy and anguish; between who they are and who they want to be. Kris Bertin's unforgettable debut introduces us to people at the tenuous moment before everything in their lives changes, for better or worse. Kris Bertin's stories have appeared in the Walrus, the Malahat Review, the New Quarterly, PRISM International, and other magazines. He lives and writes in Halifax, Nova Scotia. After a moment, all he managed to say was bad things happen. It meant nothing to me, but he seemed to be satisfied with it, like that explained everything. Picture FML raised to the literary level: this is Bad Things Happen. Ten stories of surprised disappointment in life, told in a sharp and intense style particular to Kris Bertin. Ten characters completely relatable, yet somewhat at the fringe of society: forgotten in a remote town of Canada, shoved aside by a mental condition and an alcohol addiction, buried in grief, withdrawn in the shadow of some criminal activities, or simply part of the invisible workers around us everyday. Bad Things Happen is definitely special, with its original points of view, extreme circumstances, and weird characters who still manage to elicit empathy. One night I walked into a beam of moonlight coming down from a little round windows and got trapped. “Make Your Move” is one of my favourite short-story in Bad Things Happen, showing through a series of what-ifs how its character repeatedly fails to make his life spectacular. “Everywhere money” tells us of the other extreme: its protagonist lists all the reasons for which he’s leaving utter wealth behind (“I quit because money was everywhere”), in what looks like an emotional breakdown. I was very impressed by Bertin’s direct, to-the-point style, which really conveys perfectly the emergency, stress and distress experienced by his characters, and creates a riveting tension in each story. The narration often falls into short, punchy statements with an intensity that a more flowery style wouldn’t achieve. He’s smiling, but smiling too hard, like his teeth are going to shatter. Another common theme in Bad Things Happen is broken relationships. “The Story Here” probably provides an example of an utterly dysfunctional family, in which the return of a despised father brings the worst in his children. In “Crater Arms” also, a man seems to run away from his parents, or rather from their painful absence. While in “Your #1 Killer”, a mother is unable to communicate with her adult son, who just returned home after a breakup, and whom she catches–amongst other things–burning half a skunk in the garden. Actually, almost all the characters suffer from their life, alienated from the rest of the world in some way. 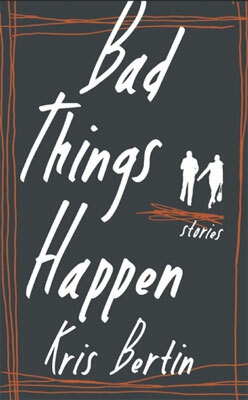 In a few words, Bad Things Happen is a brilliant and powerful short-story collection. Its characters are completely out of the ordinary, yet very relatable, as Bertin brings them to life with his impressive, razor-sharp style. These stories will make you either smile, either shudder, potentially both, but it definitely won’t leave you indifferent. A riveting, highly-recommended gem! This was already on my TBR because I’ve read a few really great story collections published by Biblioasis, but now I really want to pick up a copy of this one. It sounds so good and I really like the quotes you’ve shared. I’m also discovering Biblioasis at the moment. Lots of really good books!